I’m always on the lookout for lemon dessert recipes. I saw this on the Food Network, and since I still have heaps of lemons from my sister Sue’s tree, I thought I’d have a go. Jamie made this into a pie, but mentioned that you could pour the left-over mixture into little cups – so I decided that was the way to go. It’s a type of custard – I’m crap at custards – they never work for me, but I figured… this is Jamie – what can go wrong?? 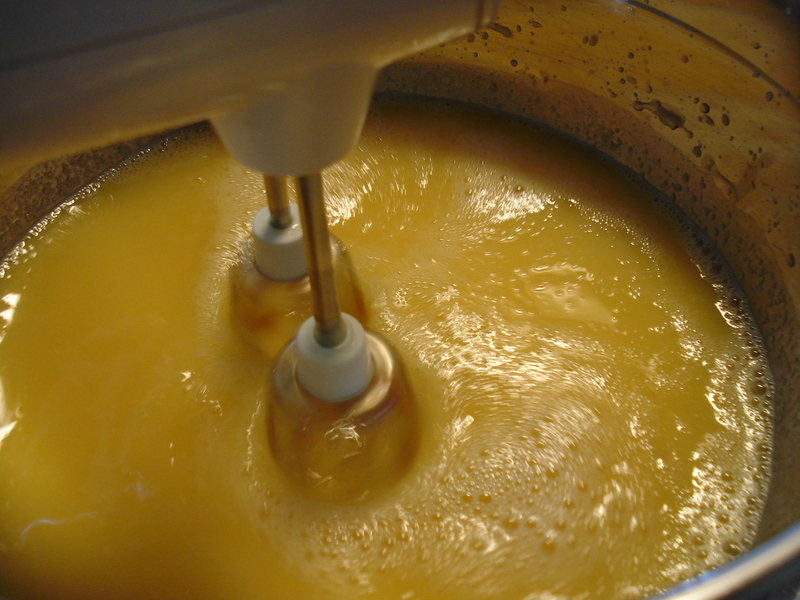 In a large bowl, mix 2cups lemon juice, 3 cups sugar, 4 whole eggs and 4 egg yolks. Put the bowl over a pan of simmering water and whisk until the mixture is light in colour and smooth. Remove from the heat and whisk in 350g butter which has been chopped up a bit. Whisk until the butter has melted. Pour the mixture into a pre-cooked pie shell, or into cups. Serve with raspberries, or toasted almonds. At least… that’s what Jamie said to do. It didn’t work for me. I did everything he said to do, but it just didn’t work. 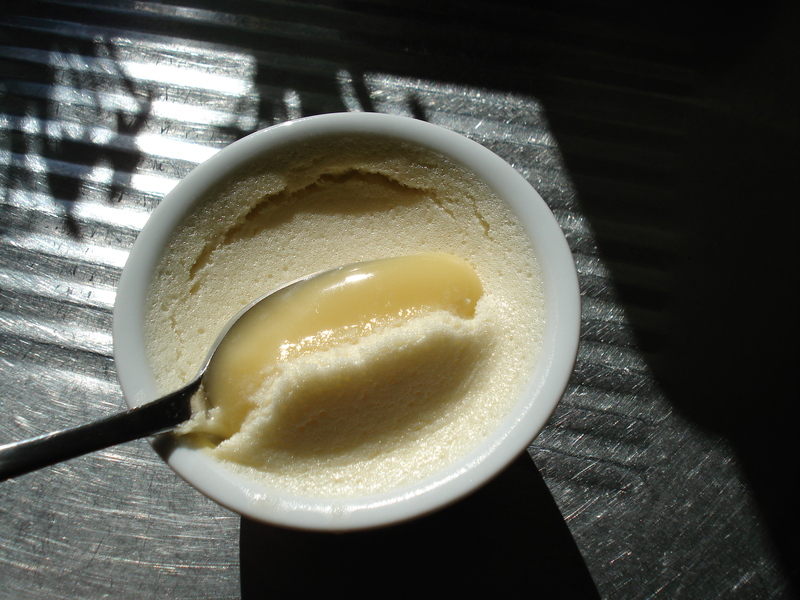 It has separated into layers – light and fluffy on top, runny-lemon-curdish underneath. Also, it is sweet enough to make my eyebrows vibrate. This is an oops for me. They look great Judith! Thanks for that. I adore sabayon! So sorry yours didn’t work out- though I personally think the waste of ingredients would have been far greater for never making the attempt in the first. Hope Rick doesn’t huff too much at you for it. It’s been a huffy old week. He’s going away on a work trip (taking the clients to Fiji) at the end of the week. He’ll be gone 4 nights and I can’t wait! 🙂 It’ll give us both breathing space and prevent me from stabbing him in the eye. Wow, Janet, that does sound like a huge amount of sugar. Whenever I see an amount of sugar listed in a recipe – I always, always, reduce it unless they say this is tart! Not sure why the custard did not work for you….it should have. Were you in a particularly humid day? Just a guess, can’t think of anything else! Thanks for sharing….I still want some! I have been trying to give up sugar – perhaps it’s my tastebuds changing??? on August 22, 2011 at 3:54 am | Reply "Susan Says.."
But I’d rather eat one than dance with George Clooney. Jimmy Smits, on the other hand…. This one was certainly “goo”…. 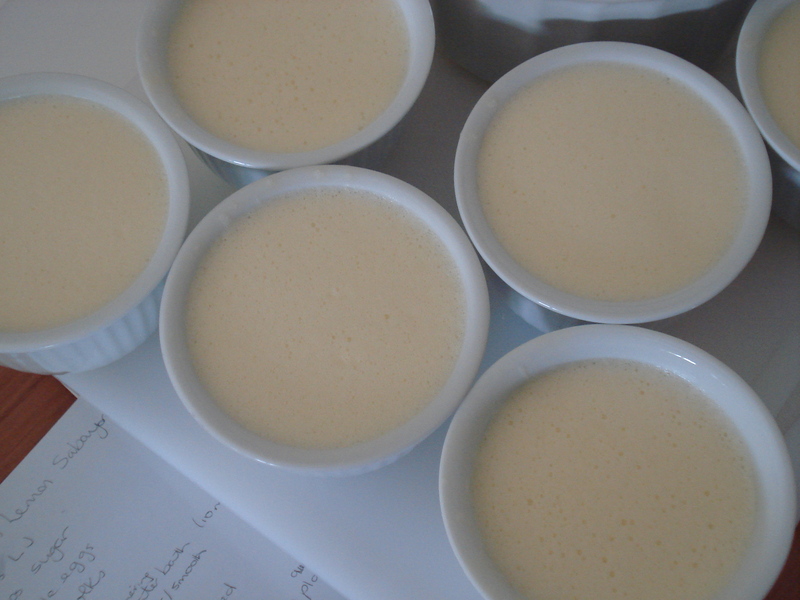 in fact, all my custards are “goo”… much as I hate to admit it… Seth is right…. don’t tell him – he would do his *happy dance* thing, and I would cry…. I’ve concluded that a little crispy foam on top is normal and tell my kid it’s the best part 😉 I have no idea why they separate. Were the eggs cold or room temp, fresh or less so? What about a bain marie? Then again it doesn’t sound like you’re too keen on experimenting to get this one right! It’s a sad day when a dessrt fails so badly it can’t be eaten. It looks pretty, but the ones that I’ve had always look better than they taste- at least to me.